An update of a classic, Trash 2 is one of the most versatile and sonically impressive distortion plugins around. Broad range of distortion sounds Great new EQ/filters. Expanded convolution. Excellent modulation. Powerful waveshaper. No panned split routing. Not enough filter-modulated presets. 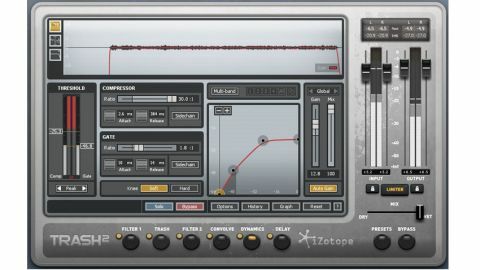 Trash was the third iZotope plugin to see a major update in 2012, and the visual similarities with Ozone 5 and Alloy 2 are immediately apparent. The update features a new general architecture, new distortion algorithms, redesigned filters, a new convolution setup and an improved output limiter. However, in practical terms, much also remains the same. "The two filters are now identical, both being 6-band parametrics with over 20 filter types to choose from per band, including two vowel shapes"
You still get six modules, headlined by the twin-stage Trash distortion processor. The remaining five have been renamed to make it clearer what they do: Filter 1, Filter 2, Convolve, Dynamics and Delay. As before, the signal flow from module to module is user-modifiable via the Graph page. So, back to the new stuff. First up, the two filters are now identical, both being 6-band parametrics with over 20 filter types to choose from per band, including two vowel shapes. Both filters now include modulation, but they lack the multiband functionality of the original Trash. Even so, multiband remains an important aspect of Trash, and the Trash and Dynamics modules can use up to four bands of processing. The Trash module has been heavily revamped, with the additional new distortion algorithms meaning there are now seven preset categories (Distort, Drive, Faulty, Fuzz, Heavy, Retro and Saturate). There's also an output filter for high and low shelving. The most significant new feature, though, is the new waveshaping window. Here you'll see the current 'base' algorithm (red), to which you can apply your own multi-point modification curve (yellow). The resulting waveshaping curve is then shown in blue. "The convolution module includes 50 new impulse responses and three microphone types. It also now uses standard WAV and AIFF files, so you can also load your own IRs into it"
As noted, the original Box Model convolution module is now called Convolve and includes 50 new impulse responses and three microphone types (Dynamic, Condenser and Ribbon). It also now uses standard WAV and AIFF files, so you can also load your own IRs into it. Rather than aiming to compete directly with the overcrowded amp simulator market, Trash 2 remains first and foremost a distortion plugin. You'll find a real variety in the six folders of global presets - from the subtle Add A Little Crunch, to the totally screwed Heavy Coughing Metals, and you're unlikely to find a broader set of distortion sounds anywhere else. The array of distortion algorithms available in the Trash module is vast (we counted 69), and they not only give you total control over the levels (input gain and drive) but also over the wave shape itself. With certain algorithms, you get an additional Style slider, which twists the character further. The algorithms range from the gentle Delicate Harmonics to the messed up Faulty Transistor, with plenty of variety in between. Should you want to process only a narrow band of frequencies, there's that previously mentioned multiband mode. The other important aspect of any amp-based distortion is the cabinet, which is now handled in the Convolve module - a convolution processor. All the previous Box-Model options are here, including 56 amp speaker styles. These are very helpful for rounding out sounds and adding space, and there are two further controls (Separate and Width) for dialling in stereo enhancement. There's also an expansion pack available for £22 called Edge, which adds a further 30 impulses and 70 presets. On the face of it, the Dynamics module doesn't greatly improve on the Squash module found in Trash v1. However, it's been brought into line with the Dynamics sections in Ozone 5 and Alloy 2. "To our mind, the biggest improvement in the Dynamics module is that you can grab the graph nodes to adjust the gate and compressor thresholds and ratios." First, you get the sidechain Detection Filter, with low- and high-pass settings for tailoring the compressor response. Then there are 'upward compression' ratios of less than 1:1 available to both the gate and the compressor, enabling you to expand as well as compress signals passing the threshold. However, to our mind, the biggest improvement is that you can grab the graph nodes to adjust the gate and compressor thresholds and ratios. We've always liked this system, and we wish every dynamics processor worked this way! The puzzlingly named Buzz delay module is now called Delay, though it adds no further delay emulations to the six from Trash v1. In fact, the only new element is the Delay Impulse Graph. Even so, it's a great addition to the filtering, distortion and dynamics, in particular the Trash control, which affects the delayed signal degradation. Of the available delay types, we particularly like the hyped sound of Tape/ Tube and the dark, imperfect nature of Analog. Overall, our only real gripe with Trash 2 concerns routing. Given the number of modules, not to mention the twin Trash distortion stages, we think it'd make sense to offer proper split routing, thus enabling panned dual effects. This feature is commonplace in amp simulations, but we feel it'd also be a great creative tool in Trash 2. As mentioned, we also reckon those modulated filters deserve a few more presets. Overall, we're very impressed with Trash 2's flexibility and rich sound, and existing users will welcome an upgrade bringing it so well into line with iZotope's other plugins.